For sardonic gunslinger Freja, the job seemed easy enough, but in raiding the ancient crypt, she finds more than she bargained for–and maybe more than she can shoot her way out of. 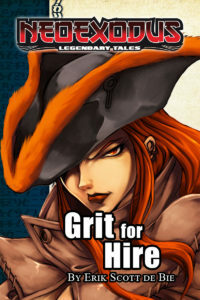 NeoExodus Legendary Tales: Grit for Hire was written by Erik Scott de Bie and edited by Joshua Yearsley.The download editions of this product has PDF and ePub editions enclosed. Orsia Wentworth is a swashbuckler–fearless, feckless, and addicted to the fight. When she jumps at the chance to compete in a tournament to face the finest warrior of a generation, she finds herself in over her head. 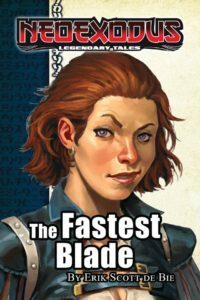 NeoExodus Legendary Tales: The Fastest Blade was written by Erik Scott de Bie and edited by Joshua Yearsley. The download editions of this product has PDF and ePub editions enclosed. NeoExodus Legendary Tales: Grit for Hire is available here!!! NeoExodus Legendary Tales: The Fastest Blade is available here!! !